Today, walking along the River just downriver from the Pumping station, there was plenty to see! 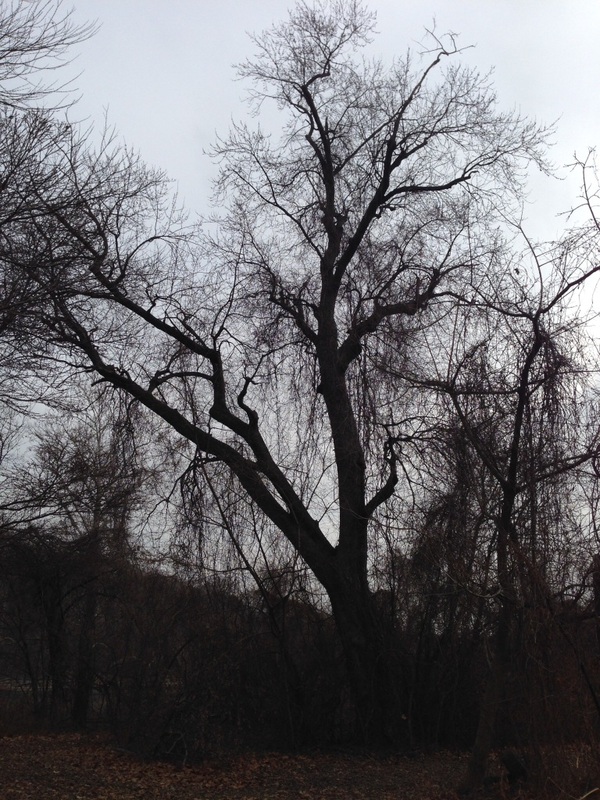 Plant life was everywhere in its winter attire creating silhouettes upon the grey December sky. The open fields, mowed and manicured, create a great space for the display of trees. Here they can grow unrestricted, showing off their ubiquitous forms to the world. Here is our classroom for the field lesson on the form of trees. 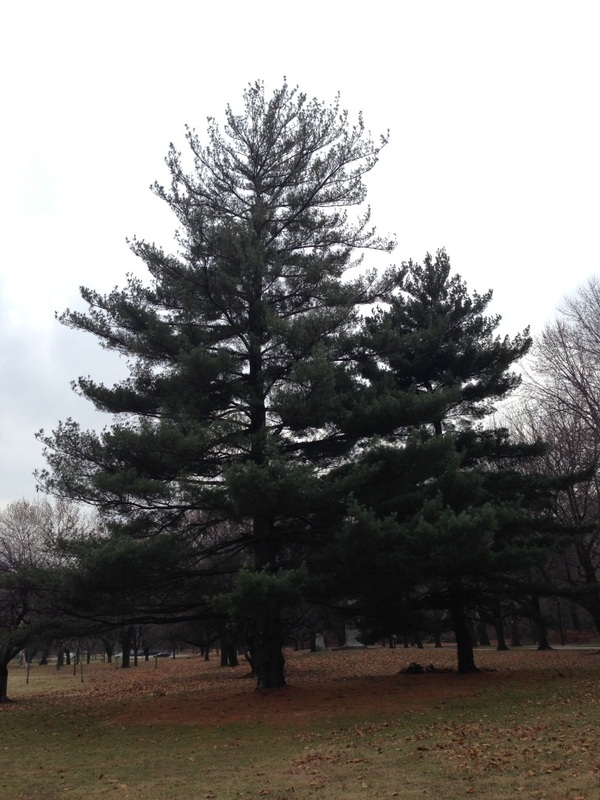 Getting to know and becoming familiarized with the the shapes of various trees is rewarding. One tree after the other, we learn the language of the trees, for they all have such unique shapes and growth patterns, it becomes a really fun readable landscape. 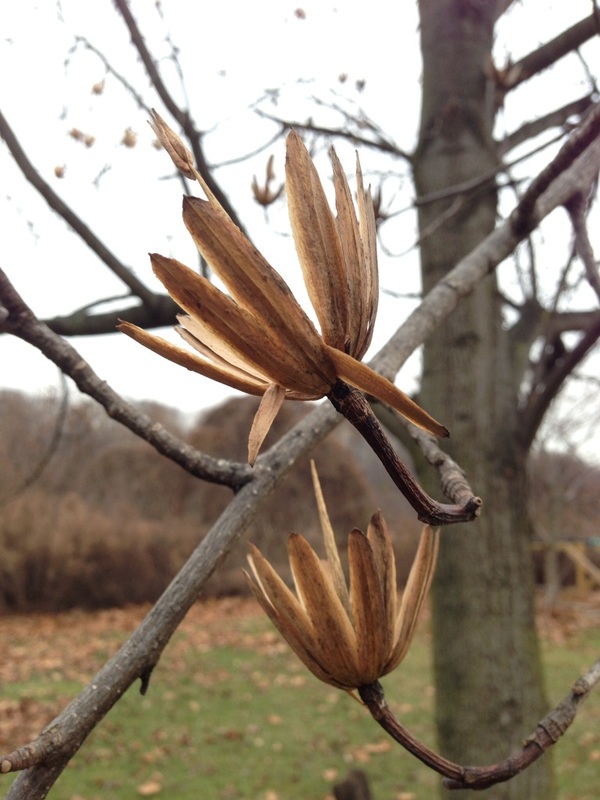 The Tulip Poplar, a fast growing very straight trunked tree, and very common in Fairmount Park. In this picture we are looking at the seedpod, here most of the seeds have been expelled. 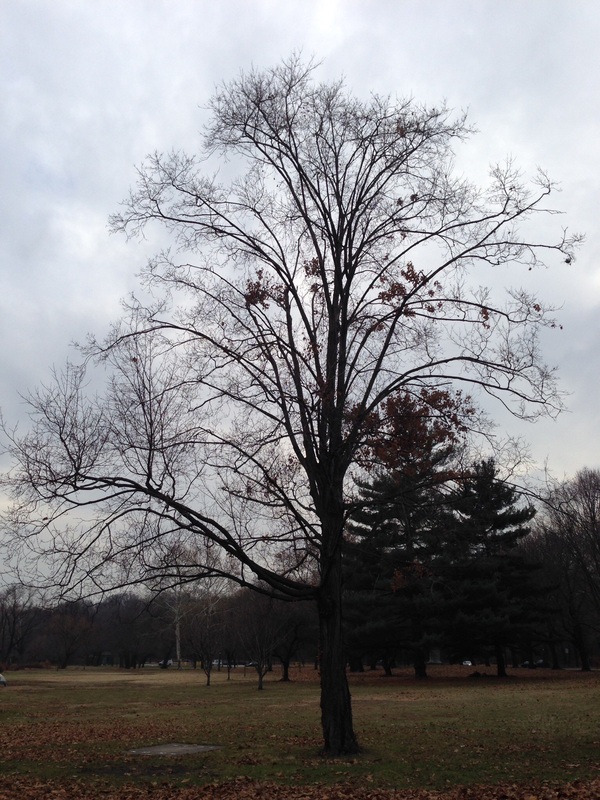 And here it is in its form, The Tulip Poplar naturally reaches outward and upwards. However in the forest setting this tree is more narrow. 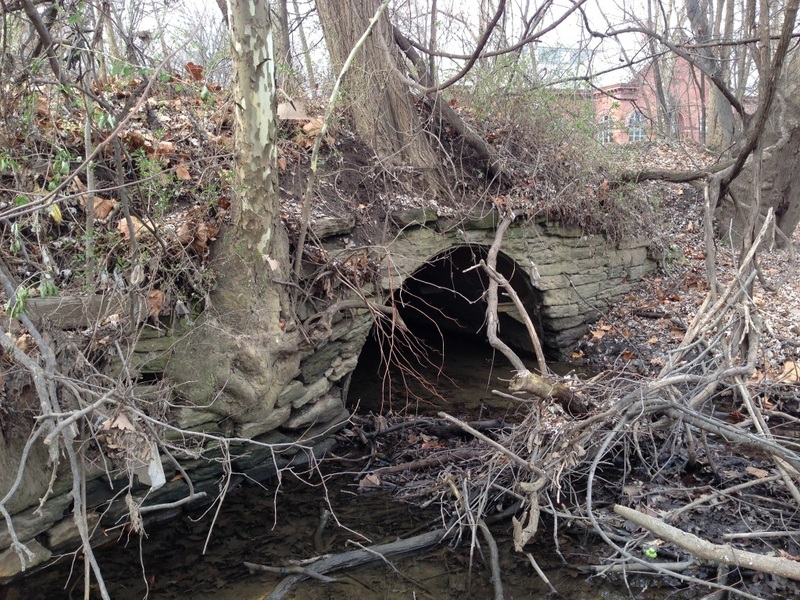 Below, a Sycamore is growing out of the 19th century drainage infrastructure. The pumping station is in the backround. Above, an Ash tree. A row of Plane trees in the back-round. 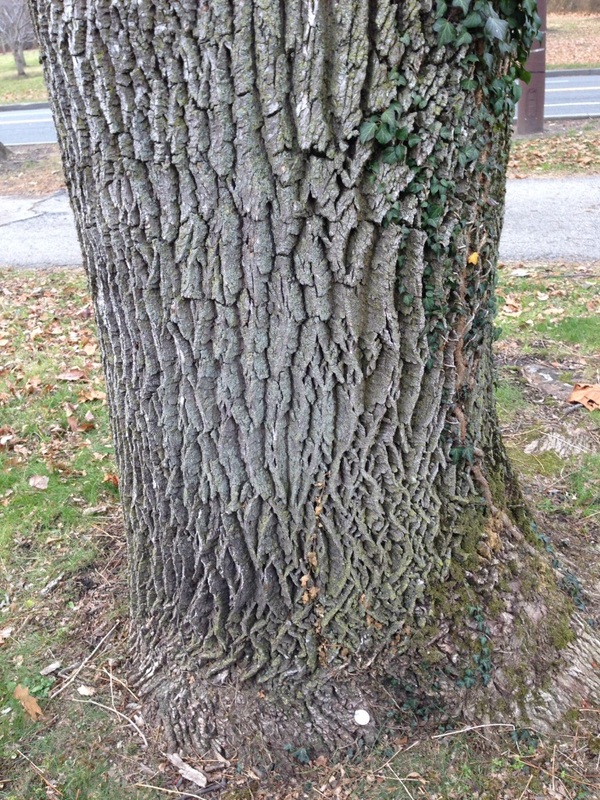 And Below the Ash tree’s distinctive deeply furrowed bark. A Sycamore in Silhouette, here we see a common pose, at an angle, often over a river or creek, but here, just over the grass. 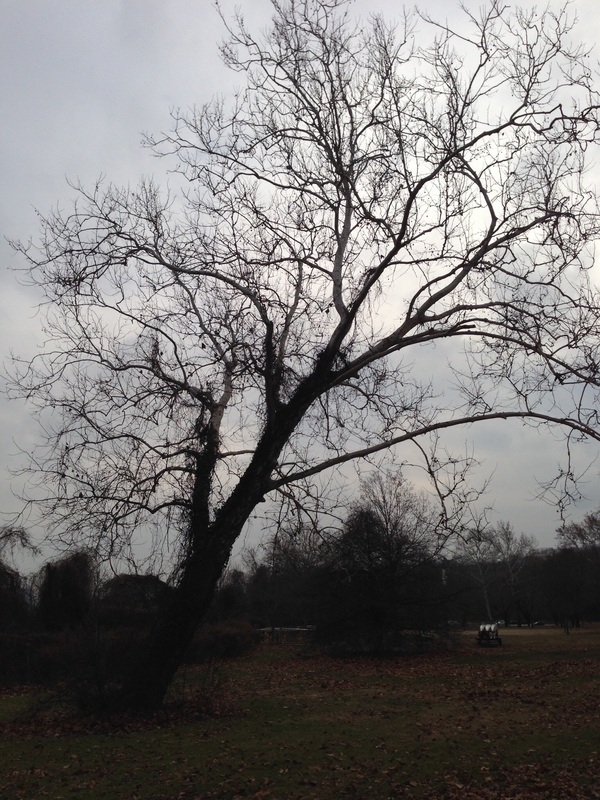 How about that distinctive gloomy winter sky? The Sugar Maple. Below the trunk with its peeling bark. 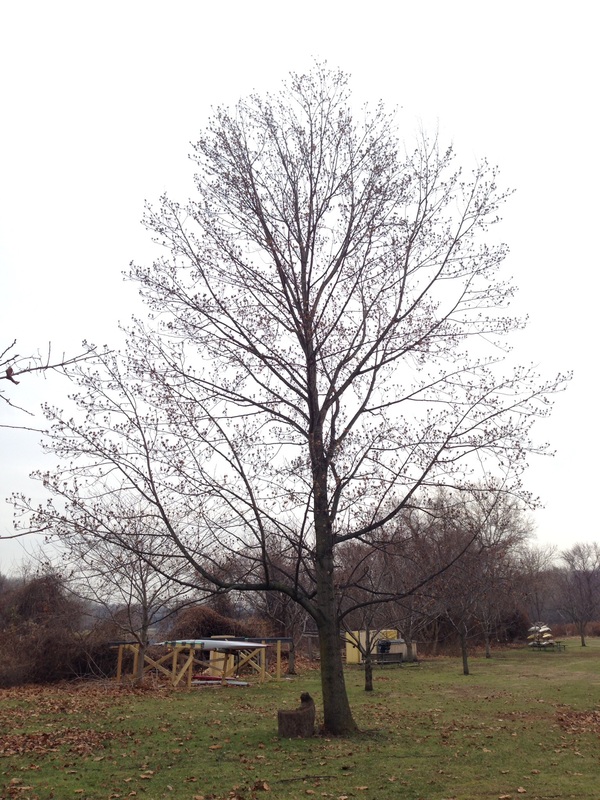 A Silver Maple with the back drop of the Philadelphia Skyline. Below another Silver Maple, this grand specimen festooned with the invasive Asiatic bittersweet Vine. 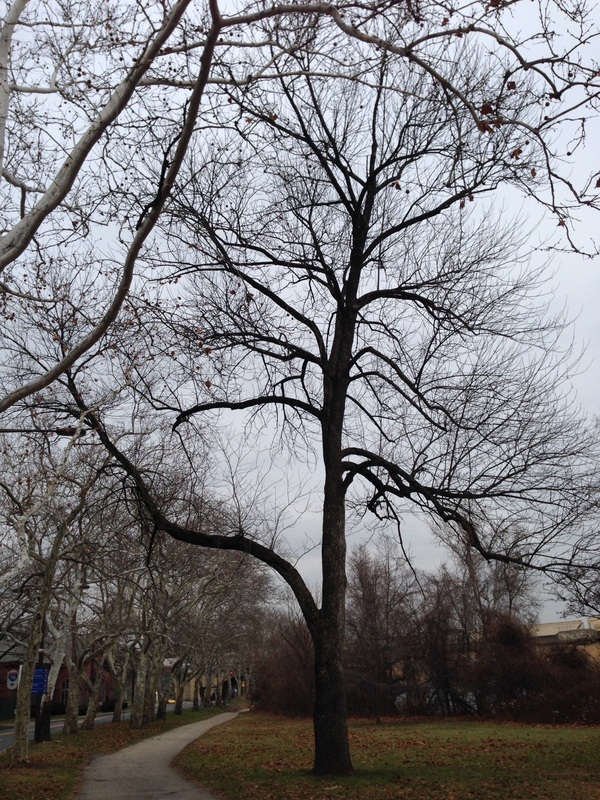 So there we have it, a few distinctive trees to enjoy on this fine December Day along the Schuylkill River. There was a Red Maple blooming, but no pictures. It was so nice to get outside and look at the trees, this is the season for seeing trees as their forms. We don’t have this opportunity in the summer, and to get out and try to identify and appreciate them is rewarding and a great reason to go outside and look at things when the weather is cold and often dismal. …..So dear readers, this week marks our fourth year of the Sanguine Root! 4 years and we are still blogging away! Keeping a blog is a lot of work, and making posts needs to be as easy as possible so we can focus on the content, but this is not always easy to do. We applaud all bloggers out there who can keep them going. We thank our readers for their comments and commitment to reading our material, and many of you are our friends and comrades. The Sanguine Root has brought us many adventures and made us many friends. We have learned much in the realm of our blog. We have posted about native Garlic mustard growing in the south of France from an outdoor balcony in the southern French City of Rodez using wifi found in the City air and then at another time finding ourselves in vast swamps in Georgia and Florida writing down the names of tiny blooming flowers and uploading their beautiful images at the nearest sign of the internet. Long hard days in Morris Park, Philadelphia removing invasive plant material documented in bag counts or perspective. Even on a remote roadside in Western Massachusetts, we have posted about gorgeous red berries growing on native shrubs in the most ignored ditches. Our adventures and explorations have opened us up to the world and its wide open spaces and the glorious green growing things that we so much love to write about hopefully in the most uplifting and flowery of prose possible! We have found that travel has helped us gain a perspective on the environment and its stewardship and have integrated this throughout our posts and philosophy. We encourage everyone to share their own experiences publicly, whether it is about plants, the weather, rocks, waterways, their commute to work, etc, and bring to the world something that is ground down to its core importance and displayed like a Christmas tree for all of the world to enjoy. This year our posts have not been as frequent as we have been focusing our free time on concerns regarding the rehabilitation of Viola Street in West Philadelphia, helping to stabilize this beautiful block of Victorian rowhouses. However, The Sanguine Root persists vibrantly and we will continue to post pictures , essays, thoughts and whatever else catches our fancy! Please stay in touch and we are on facebook where we often liveblog about Morris park often on a weekly or daily basis. Its been a great 4 years and thank you for all of you who have stayed with us and do look forward to more fresh material! Upcoming we have a time -lapse showpiece that we are working on right now, a camera taking a picture of the forest in Morris Park every hour and a half and has been since early September, this should make for an interesting video! As part of our Land Management Class we were asked about formulating questions about the topic. These Questions were to be informally presented to scientists and experts on the subject. This was a unique and rare opportunity to lay out as much as possible to this wonderfully assembled group of knowledgable folks and we worked very hard to do just that, assembling a whole host of questions and on-the-ground scenarios for our audience. We were also asked to come up with an experiment that could help in answering questions which we also created. Would it be a good idea to create a survey of park users, citywide using scientifically accepted techniques of random data collection, analyses etc to get an overall picture of what Philadelphians want to have in their parks? The concept of Park frontage was presented clearly in our class and the idea that what can be viewed from the public sphere outside, looking into the parks plays a greater role in the public perception of the parks in general and how we manage these “intersections” has a specific importance in the outcome of management practices. This being said, Should the concept of a trail system that rings the perimeter of Philadelphia’s parks be examined more closely and looked at on a neighborhood by neighborhood basis, citywide? Would it be beneficial to create a circuitous trail system around the perimeters of the parks Pennypack , Wissihickon , East/West Park, that was manicured and landscaped, using transitional forest edge localized plants, Smaller trees, signage that served as a gateway trail system, educational outlet and even with benches and picnic areas) Would it be a good idea to propose this trail network be just enough into the parks for homeowners to feel comfortable and as close as possible to the edges to be effective without encroaching upon the home-dwellers adjacent to the park? The circuitous trail system brings up a whole host of questions relating to park edge development and enhancement and has the potential to effect hundreds of acres of park land throughout the city. Also, would it be effective to actively recruit communities, homeowners, renters and all of the people living directly adjacent to the park to take an active stewardship role in small, defined areas of the edges of the park, just outside their homes? Could this strengthen the edges of the parks city-wide, by creating a multitude of small, permitted groups managing the areas just outside their houses? How hard would it be to recruit these groups and how much would that cost? Could classes such as this one be funded and created and taught citywide to guide this effort? Could more staff be hired by Parks and rec to oversee these many groups? What would be the political environment of multiple groups, large and small, operating within one Park? What would the initial cost of recruiting and enabling more permitted groups and what would be the long term cost savings in terms of free labor/ public good not to mention the benefit that other species would have such as core forest songbirds, rare and endangered plants etc have on such a production? Would a wide variety of trail types maintained as such, be a valuable asset to the parks, where some trails are wide and well-marked and others are like mountain trails, narrow, sometimes steep and marked by flashes of paint on trees? In the Haddington woods, would it be beneficial to have a wide, well marked and evenly bedded trail to lead to the most prominent points, such as Cobbs Creek, and perhaps the Pond area? Could the Parking lot for the Bocce club include public parking like Kitchen’s Lane in the Wissahickon? Would solid signage, graffiti resistant and embedded in concrete at the entrances and at critical junctures within the park improve the overall comfort level and ultimately the usage of the park by the community and the public at large? In areas where the trails run through sensitive ecological areas, such as ones with rare or endangered plants, planted areas, young and sensitive trees, habitats of ground nesting birds, such as oven birds ( which are reported in Morris Park) would it make sense to have low fencing or some diversion to prevent dogs let off of their leashes or people from entering? 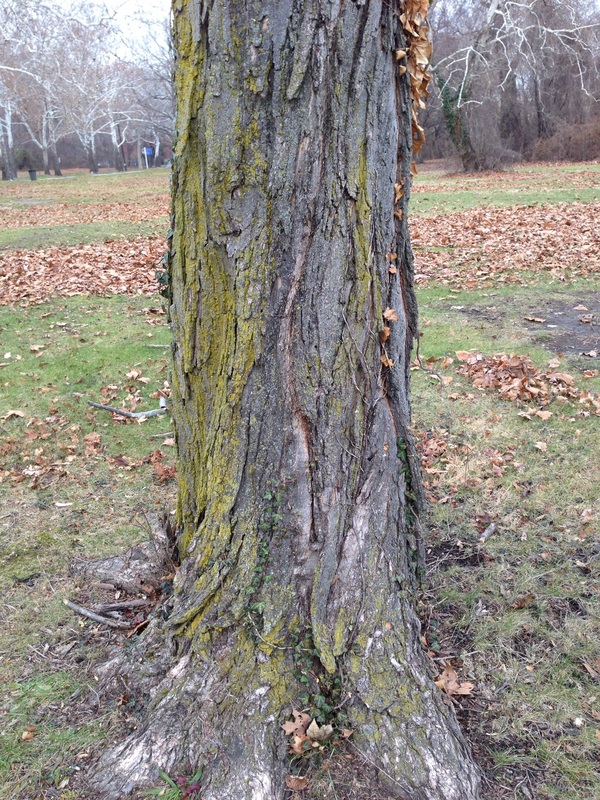 What are the effects of trampling from off-leash dogs in Fairmount Park as a whole? What are the effects of off-leash dogs generally, from a point of view of noted and documented disturbances and anguish caused, both to people, dog owners and leashed dogs? What could be done to educate the public about obeying the laws, what is the best way to approach this problem and how much would it cost? In Morris Park , we have witnessed much trampling by off leash dogs of native plants, how would we best address this issue in the most sensitive and informative manner? How do off-leash dogs effect the habitats of ground-nesting birds, such as oven birds? What is the most effective way to present our concerns to the park –using general public? Would signage on trails about ground-nesting birds help inform and guide dog owners to follow the existing laws and leash their dogs in these sensitive areas? Considering the high volume of dog owners and their desire to let their dogs off leash in the existing forests, would it make sense to provide fenced in dog parks across the city and then fully enforce the existing laws to protect other species from trampling and extirpation, paralleling the need for open areas for dogs to run free, close by to dog owners residences? How would this be paid for? Perhaps a dog owners tax levied by the city on mandatorily registered dogs? A dog tax to regulate and manage dogs, and used to provide the necessary habitat for Philadelphia’s lovable canine pets? How could this be studied, explained and looked at seriously by the legislators, citizens and implemented realistically? The other issue regarding trails and dogs, is the issue of dog-less trails. Is this realistic? Something to ponder? Sort of like bike and horseless trails? How about dog friendly trails, full of the ameneties that make dogs and their owners happy, kiosks with bags and waste containers, leading up to the dog parks perhaps. As far as dog waste is concerned, how much would it cost to have an effective educational campaign to educate the public about the bacteria in dog waste and how it can effect the water ways that we drink from? Like the water cycle diagram, a clear depiction of where our water comes from and what is going into the water? ( not to mention how unfortunate it is to step on dog waste while trying to enjoy the park, and how unsightly it is to see and horrifying it is to have it end up in your house). Trails in general can be subjects of intense discussion and there is much that goes into their creation, maintenance and dissolution. There needs to be much more focus on where trails are best suited and if they have a lifespan at all. Does a trail have real lifespan? With the erosion issues they can cause, perhaps trails could be closed and moved on a some sort of timeline- a twenty year trail, a 10 year trail, 50 year trail, etc. The new trail would be opened in a best practice location, and the plants could be moved to the location of the older, worn out trail. We have successfully implemented this practice in Morris Park, so much so that it is not noticeable. Should the location of trails be studied in Fairmount Park so there is a more agreed-upon consensus of trail maintenance? Is soil compaction/erosion a problem for closed trails and should these trails be tilled and aerated and possibly re-seeded with locally collected seeds? Should the trails in the Haddington Woods be studied and evaluated? Should some of them be moved, closed, re-assigned, or new ones opened to best present the park to the public? How could the new trails be treated to best prevent erosion and even prolong the life of the trail and reduce maintenance? In general, should mountain bike trails be regulated and monitored? Are they effective public use and are beneficial? Should they be looked at for increasing Park usage in Haddington woods? What kind of trail would increase the publics usage and enjoyment of Haddington Woods? Trails with signage? Evenly graded? Easily accessed? A trail map in signage that showed circular routes? Describing the environments viewed? Would a trail that had access to nearby major hubs of activity such as 69th street or Millbourne be beneficial to the park and the community? How much would it cost for Haddington woods to be connected to 69th street and Millbourne and could a community group(s) be assembled to keep an eye on this entrance (s) and would this be an asset to the populace? It appears that part of the problem of appropriate public usage of Haddington Woods Park is that more than half of the park is blocked by the 69th street Septa Facilities along with Cobbs Creek Itself, creating a double border. In one sense this creates a sense of wilderness that has its own benefits, on the other, it is a border that separates communities from the nearest parkland/forest. What can be realistically done to address this issue? Would adjacent political entities, such as Upper Darby be willing to partner with Philadelphia, and Septa to create a bridge into the Haddington Woods, all with the backing of Community groups and dedicated volunteers ready to make this ‘back end’ of this Philadelphia park feel safe, used, and doted over. How much would that cost? Also from a trail and access perspective, isn’t the golf course very problematic? Doesn’t it seem like the golf course itself is like a giant wall that divides the Haddington Woods from the rest of the world? Why is it that the Haddington woods seems to have only a very few trail heads, one closest to 63rd and Market and the other at the Bocce Club. Just two trail heads for the size of this park is unacceptable considering the size of the population around it. Is there something that can be done to open up this park for more people? Is the fact that it is so cut off and inaccessible actually an asset to the park’s condition, hosting a high quality forest? How is this use of land justified? Can this be quantified into dollar amounts? Is this golf course paying for itself as a community and environmental asset? Perhaps it is hosting trees that are allowed to grow in a way that is not found dense forests? Is this valuable enough to justify so much land consumed with a lack of public trails and a problematic creek management approach? Are the golf courses an important host to rare and endangered species that we need to know about? ( It has been witnessed one situation where the golf course was mowing down the rare Elephantopus carolinianus )Is anyone studying these and should we be aware of it? What would it take to have a connective trail between Morris Park and Haddington woods, two adjacent neighbors just one mile apart , functioning as if 10-20 miles apart with the lack of connectivity, community connections, and separation barriers, namely the golf course. Could a connector trail along the edges become established? Could the golf course remain, but altered with meadow and woodland edge habitats built in to the course, along with publicly used trails, sitting and picnic areas or not? Perhaps the golf course is not a suitable use for this land in consideration of the populace adjacent and the associated needs of natural green space and trails? Or is the golf course benefitting the public by serving its needs and providing a suitable habitat for other species as well? Should this use of land be studied more carefully? If the golf course was not there who would manage these lands and what is their vision for them? Would an abandoned golf course lead to a blighting effect of the surrounding neighborhoods? 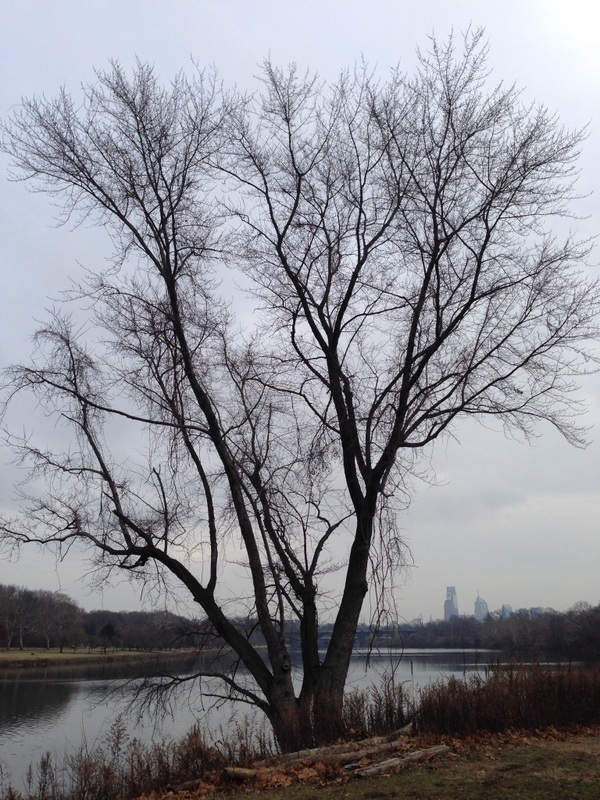 Could golf course users be persuaded to become better land stewards and promote a beneficial land use for critical areas, such as along Cobbs Creek? Would the idea of corridors of riparian plantings become attractive to the golf course users and newly transformed environmentalists? How much would it cost to convince and educate the golf course users into the environmental and ecological approach to land management? Watching the Mayapples come up is joyful. The little delicate green umbrellas are at it again! The path between the Recycling Center and the Strawberry Mansion Bridge in West Fairmount Park has a great display of the earliest emerging Mayapples on the west side of the Schuylkill River. 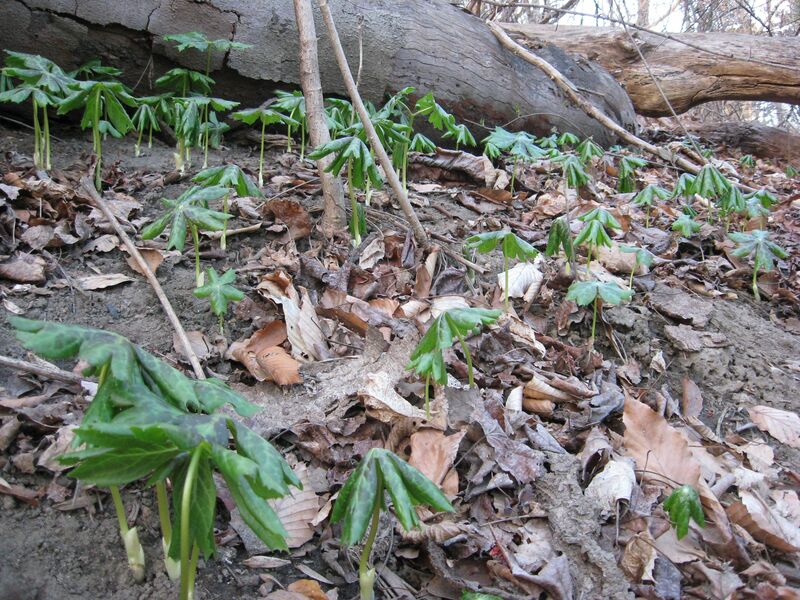 This colony of Mayapples will go dormant before other later emerging colonies will. 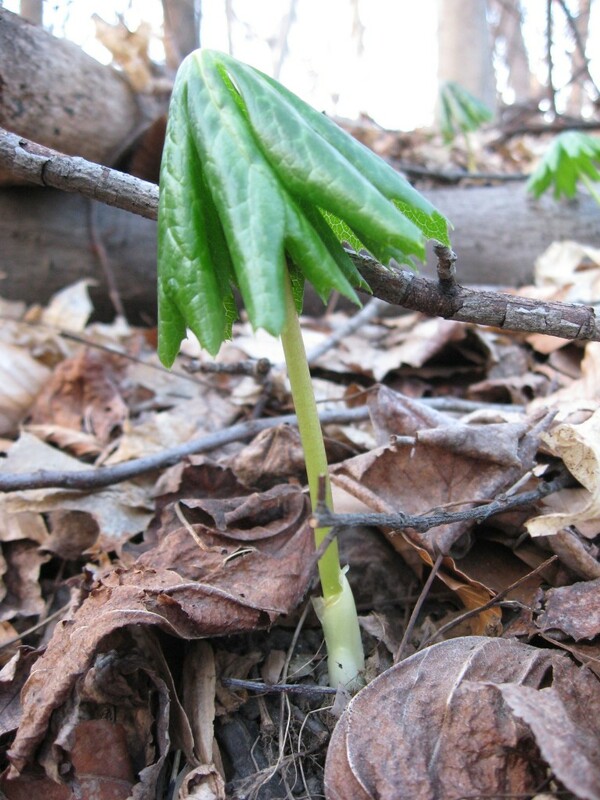 Like many plant colonies, this one has a distinct habit of being, different from other Mayapple colonies found in other parts of the park. They are in a protected ravine, close to Skunk Cabbage, and a small brook. Much lower in elevation than in Morris Park. Beech and Red Maple above. When Mayapples first come up they are shiny and perfect. When they do emerge, they grow very quickly. They open up just like an umbrella! Let us know if you find them in your woodland.